10.21.15 - Vance, Gov Mike Pence, Centier President Mike Schrage and Gary Mayor Karen Freeman-Wilson at the Centier grand opening in 504 Broadway. 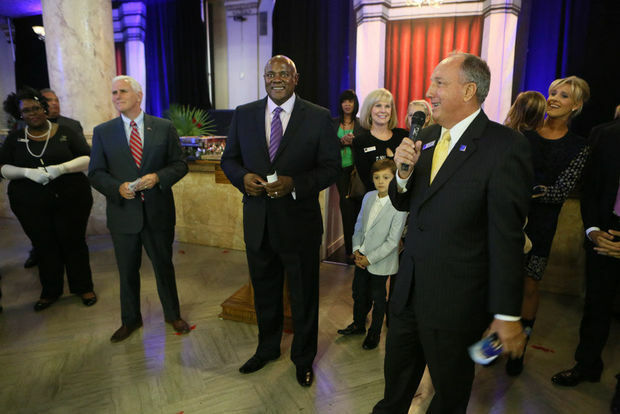 10.21.15 - Vance, Gov Mike Pence, Centier President Mike Schrage and Gary Mayor Karen Freeman-Wilson make comments at the Centier grand opening in 504 Broadway. As Managing Partner, Vance manages the daily activities of Gateway Partners LLC and 504 Redevelopment LLC the owner of the Gary State Bank Building at 504 Broadway, Gary IN 46402. His management functions include the oversight of operations, marketing, business development, project development from concept to reality, assist in developing financial models & real estate development needs assessments, and the execution of all commercial real estate development services implemented by the Gateway team and our partners. In addition to his efforts at Gateway Partners, Vance also owns Advance Construction Services LLC a MBE certified construction managment firm and Advance Energy LLC a MBE certified fuel distribution firm. Advance Construction Services is a trusted builder for a number of the Gateway Partners real estate developments. His firms have completed numerous construction projects and wholesale procurement opportunities throughout the region. Click Vance's photo to send him an email.